I was watching TV last night, and a commercial came on that made me wonder out loud in writing on Twitter why the Flying Nun would be hawking Boniva. One of my online friends clearly explained it to me that since her flying career is over, she needs to take care of her hollow and brittle bones. And it makes perfect sense too! Birds (and I guess flying nuns) can fly because their bones are very light (yes, and because they have wings, I know). But whoever was responsible for so thoughtfully and intelligently hiring Sally Field as the spokesperson really deserves a lot of credit. That took some deep thought! Anyway, if you really care, you can see Sally's Tips at the ManageOsteoporosis.com site, which just redirects to the drug's site. Rock it, Gidget! Today I'm drinking Improvisación, an Oatmeal Rye India-Style Brown Ale brewed by Cigar City Brewing in Tampa, Florida. First, congratulations to these guys for winning their fight with the Tampa City Council on some stupid zoning issue. I know a ton of people really went all out to keep their tasting room open. Personally, I've never been there, but that doesn't mean I am not thrilled by the Council's narrow vote in Cigar City's favor. Eventually I'll make it! 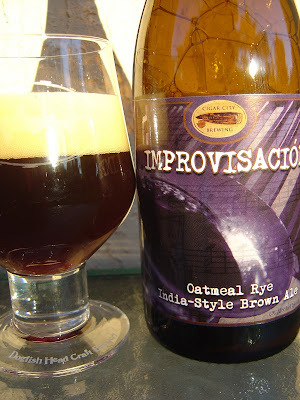 So Improvisación comes in a wine bottle with the label designed by Matt Callahan at ManMadeMurals.com. The theme is musical instruments and the colors are shades of purple; you really need to look carefully at the label for details, but it's very interesting. 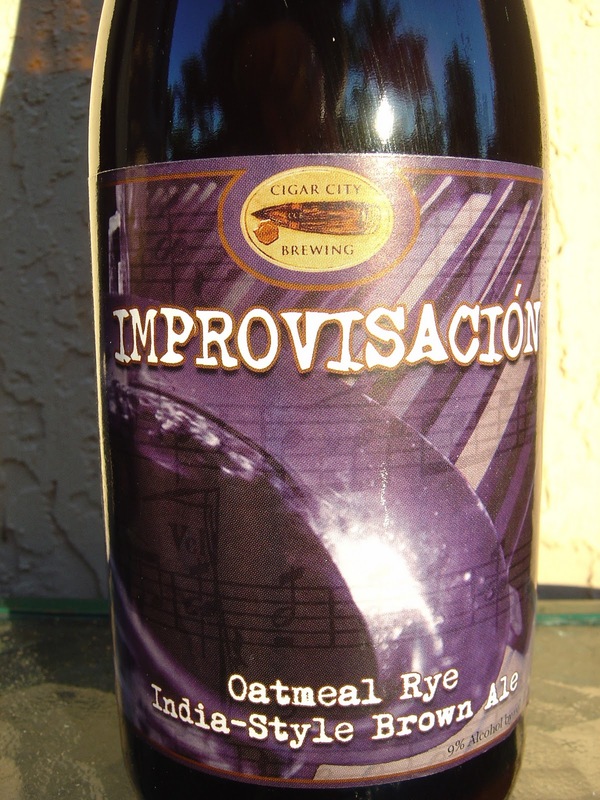 Further, this is "brewed with a nod to artisans everywhere who have passionately pursued their craft while embracing improvisation". Big head. Rye with some burnt caramel and a touch of toffee on the nose. Nice but not very strong. Some malty and coffee flavors start things off, a little burnt in the beginning. The beer was briefly sweet before an extremely citric bitter orange and lemon rind attacked from every direction. There is a little bit of spiciness though I am finding it rather difficult to distinguish any distinct flavors. It's more of a mish-mash all over the place. The 9% alcohol dries things off toward the end, but in a way that is quite astringent and not very pleasant, especially considering the aggressive carbonation highlights that aspect. I don't know. I guess the main flavors are lemony bitter ugly mixed with burnt coffee malty mess. BTW, I did wait for a while to see how this beer would change with some warmth. Slightly less of that ugliness but not close to enough. This beer had malty written all over it and delivered none. Looks can be deceiving. Not a great beer and not enjoyable. I didn't finish the bottle. 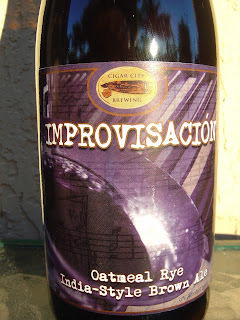 O. M. G. I just criticized the Anointed One, Cigar City Brewing! Here comes the wrath of Hell from some zealots who think this brewery is perfect! Here's a tip. I like this brewery and think they make some terrific beers. But you should obviously listen to me and buy a different beer!